Crop Circle Tours 2018 -- Join the Original Crop Circle Tour, Experience the Magic This Summer in England! A universe where magic rules . 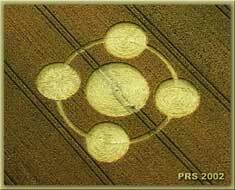 . .
Resonate with the oldest and original Crop Circle Tour. Always with small groups and special guests. Videos of unexplained camera and battery failures in crop circles! Do you want to experience crop circles, UFOs, balls of light, shadow people, and things we can't name? Would you like to discover the mystical sights and sounds of ancient Britain? Ready for a close encounter with nature's resonant, subtle-energy systems? Join us on a truly unique Scientific and Spiritual Research Adventure as we search for the truth about Crop Circles. Get ready to go to the edge of the unknown and experience the journey of a lifetime. For years, we've been baffled by weird and anomalous energies in and around crop circles, perplexed by their strange effects on our equipment, batteries, and cameras. Now we've assembled a crack team of scientists, researchers, and local experts to help us penetrate into the heart of the mystery and discover the truth behind the crop circle enigma in the beautiful English countryside. Join us as we uncover the mystery of the crop circles. We're going to uncover the secrets "They" don't want you to know. "A perfect trip . . ." G.H. special guest stories, and just the right amount of structure. Thanks Simeon!" P.G. "This sacred places tour will expand your mind and banish limitations!" J.G. "Highly recommended! The best tour I have been on . . ." L.B. "I loved this tour! The discussions with the experts were wonderful!" A.W. "Thanks again for a fabulous tour! I’ll be back...." C.E. "Ron and Simeon are wonderful guides in this area. They really know their stuff!" H.L. On our famous Crop Circle Tour we'll encounter real mysteries. This tour is some of the most fun you can have while being educated in Celtic history, culture, archeology, and mysteries. You'll have spiritual access to the unknown through the magical places and temples we visit daily. Our tour size is small: space is limited so book early! Don’t miss this opportunity to understand what is being hidden from you. Expand your mind, broaden your life and spiritual evolution. We have great guest experts! Visit historic pubs! You'll have a wonderful and unusual vacation! New! Our full tour now includes a complimentary Resonant Viewing Class. This tour is NOT for everyone. You must be curious, open-minded, and ready for the unknown. We don't know exactly what we'll encounter when we go into the circles this July. Every crop circle is different: be prepared for the unexpected. Intrigued by a journey into a new reality? The discovery of a lifetime awaits you. Call us right now for more detail. "This tour was better than a college course!" S.G.
"The experience of a lifetime!" R.M. "A whole new wonderful world is now open!" M.T. Get Special Information and News You Won't Find Anywhere Else. and Dr. Simeon Hein on the Travel Channel! Crop circles represent a way to contact the unknown, "fringe science," and new thinking, all at the same time. No one at this time can explain, exactly why crop circles have the strange effects that they seem to cause on cameras, batteries, and other equipment. In my view, it has something to do with crystals, electrostatic charges, and morphology. But if you are brave enough to venture into a crop circle, you might get a chance to experience this phenomena for yourself. Join us this summer in England and experience the magic of crop circles for yourself. 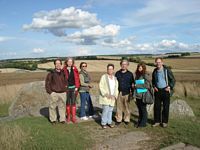 We will spend a lot of time visiting the sacred sites in the area including Stonehenge, Avebury, the West Kennett Long Barrow and more. Our goal is to seek to understand the nature of these power places and bring some of their magic into our lives. Why Go On A Crop Circle Tour?